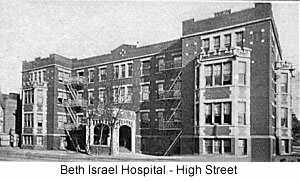 I was born in Newark on Oct.1, 1923 at the old Beth Israel Hospital on what was then High Street. We lived at #4 Plum Street - a street no longer in existence that ran from Washington Street to Plane Street (Now University Avenue) between Raymond Boulevard and Warren Street (Plum Street was named for the Plume family - an old time Newark family. They owned most of the brick row houses on Plum Street and had a rental office somewhere downtown). My mother ran a rooming house at that location. Rooming houses were popular in that era - before the days of motels there were either hotels or rooming and/or boarding houses. My grandmother owned two rooming houses at 175 and 179 Washington Street. The back yard of 175 conveniently faced #4 Plum Street. The front of 179 Washington Street. faced the Cedar Street Subway. The subway was very active at the time, being used by several trolley lines. It ran from Washington Street to a loop in the basement of the old Public Service terminal. There was a station on Broad Street in the basement of the old Kresge's department store and McCrory's 5 & 10. I used to set in the living room of #179 and watch the trolleys enter and leave the subway and dream of far away places. One time my grandmother took me for a ride on the #43 line to Jersey City and back - I thought I was in heaven! The subway is still there but not in use - being fenced off at the Washington Street entrance and probably walled-off in the vicinity of the old terminal. I understand they might use a portion of the east end which had a connection to the City Subway, for the new light rail line from the Lackawanna Broad Street Station to Pennsylvania Station to Elizabeth. We also frequently took the trolley from the Public Service Terminal to my paternal grandparents in Sewaren on the old Fast Line! When the houses on Plum Street, and Washington Street were demolished, we moved to Bloomfield in 1927 where we resided until 1991 at which time we moved to Brielle where we now live. My grandmother moved to another rooming house at 54 Warren Street and also operated two other rooming houses at 238 and 240 Plane Street (University Avenue) until about 1962 all of which have been since demolished. At 242 Plane Street there was a Katz's furniture store. At the corners of Warren and Plane Streets, at the Southeast corner was a tavern called the Pink Poodle, on the southwest corner there was a Chinese noodle store, on the northwest corner was Kramer's butcher shop while on the northeast corner was Wishnie's paper store. My familiarity with downtown Newark continued as I worked for New Jersey Bell on Broad Street from 1946 to 1983 so we frequently took walks downtown to the old Child's restaurant on Broad Street as well as Schraffts, Hahne's and Kresge's, Kelly's seafood on Park Place and the Oyster bar in the Public Service Terminal - the good old days!